Thomas has a much modified Royal Enfield. Identifying a Royal Enfield is a challenge for me, especially when it comes down to numbers chiseled into motors or frames. 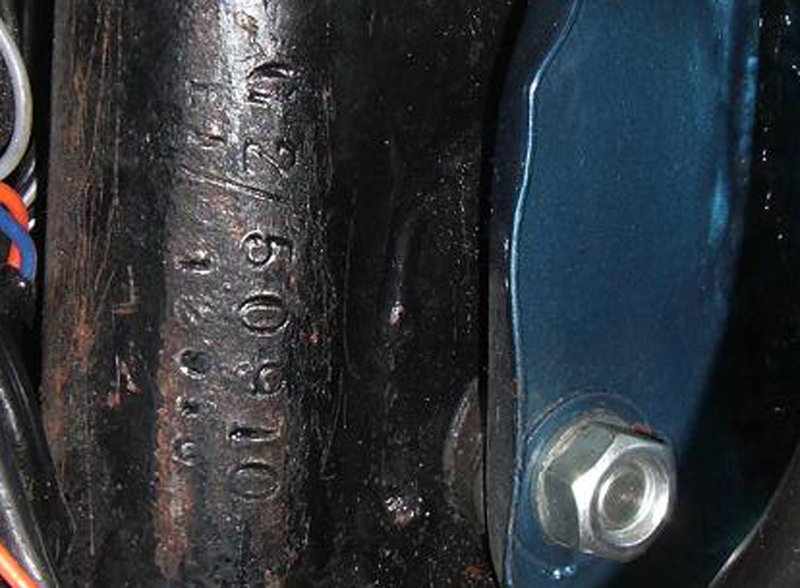 Help identifying one mystery motorcycle came recently from the chairman of the Royal Enfield Owners Club. 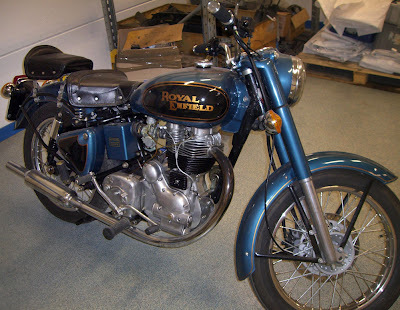 "I wonder if someone can help me identify my supposedly 1966 Royal Enfield. My bike has Frame number: G2/50910 E1/12910. Engine number: G2/50910 20620 E1/12910." Sprung pillion seat and disk brake are common modifications from India. "350cc Bullet G2/50910 left the Redditch factory in April, 1962 as a 'completely knocked down' kit of parts. 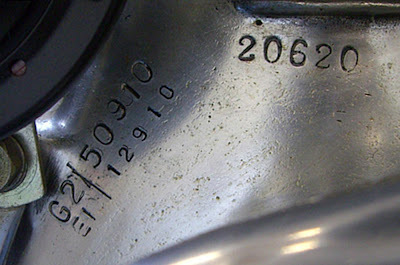 The EI number was added at the Madras factory on assembly." I appreciated the information, as does Thomas, who wrote to add that "I have since spoken to an Indian company called Soni motors in New Delhi; they say it's a company called Madaan Motors that restored my bike with new parts." He attached the pictures seen here. Lots of numbers on the motor. "If you have an Indian built 350cc bike with pre-VIN numbers (those starting with ME3) I would be grateful if you would let me know the engine/frame numbers of your machine and the model and year you believe it to be. Numbers at top left (facing forward) of frame, often hard to read. "If you have one of the early machines with both G2 and E1 or E1 and B prefix numbers, please be sure to let me have both. Some will only have a B prefix number and some of these may have an alpha/numeric suffix. From 1982 on, it should have a B number with a digit in front." Graham is asking that you include digital pictures of the numbers to absolutely verify them. You can email him at chairman@royalenfield.org.uk or write him at 39 North Moor Road, Huntington, York. YO32 9QN, United Kingdom. Hi David I don't think it's a ignition key in the battery box. The Indian model bullets have a key lock for the battery cover. You can take the cover off to inspect your battery just by turning the key. Jessie, thank you for the correction! That has to be it. Full details on having your Bullet identified, for free, by Graham Scarth, chairman of the Royal Enfield Owners Club UK are in my post at this link. 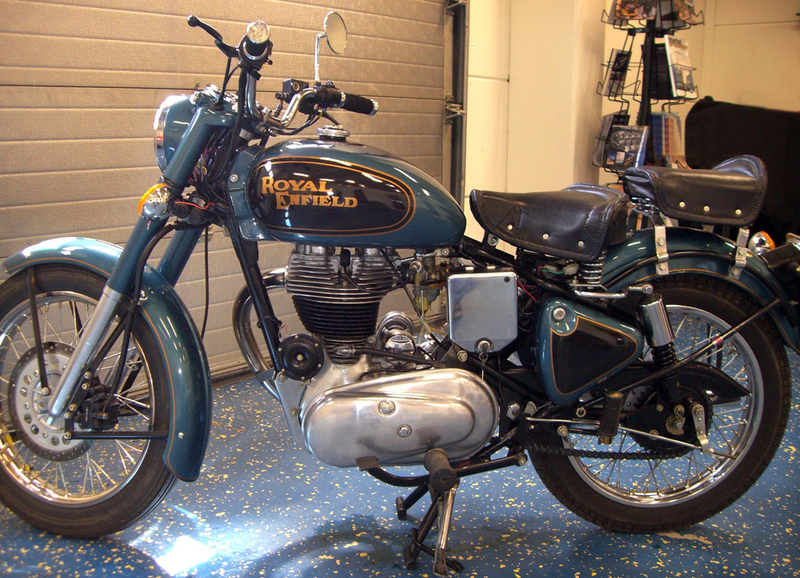 I am Biju Mathew from Australia .I have purchased a a Royal Enfield from India intended to import to Australia . It has got an Engine Number G2 70256 along with a number EI 32256. Same number is on chasi as well. Could you pls advice its history .This helps me to import it to Australia as an enthusiast motor bike recovery scheme as classic ROYAL ENFIELD . Biju, you can read an explanation of how to date your motorcycle in my blog post at this link. Basically, you should send the information above to Graham Scarth, chairman of the Royal Enfield Owners Club UK at graham.scarth01@gmail.com Graham has made a study of these numbers and likely will be able to help you. He does this at no cost to you. It would be helpful to him if you would attach to your email photos of the bike and especially of the numbers. Sometimes the way the numbers are applied to the motorcycle can provide valuable clues. what kind of petrol does it need? lead additive?